Back-in angled parking on Second Avenue in front of the Albany Post Office, installed this spring on the left-hand side of the one-way street, continues to be a challenge, a point borne out by these photos snapped on Monday afternoon. 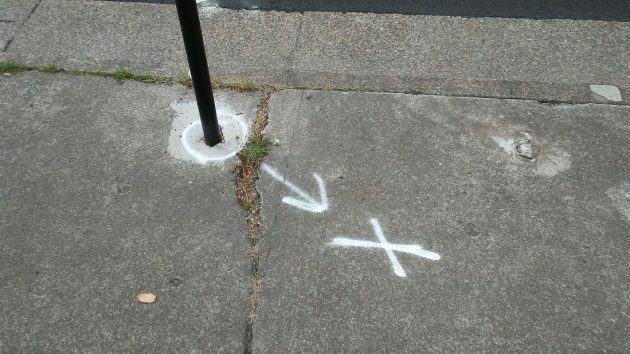 One of the five sign post holes on Second that all turned out to be too close to the curb and, judging by the sidewalk markings on all of them, are going to be moved. New trees and their stakes seem to be in jeopardy as well. And backing into spaces between the lines still taxes at least a few motorists. City officials hoped that people parking on that side of the post office would soon get the hang of the new — and for Albany novel — layout. Maybe they will, eventually. Or maybe they’ll try to park anywhere else. Don’t forget the post office at North Albany shopping center. There is always parking, rarely a line, and friendly staff to greet you. Who ever thought up this lame-brain idea should think up one more and drop dead. Can’t help but think this is another example of common sense thrown out the window. 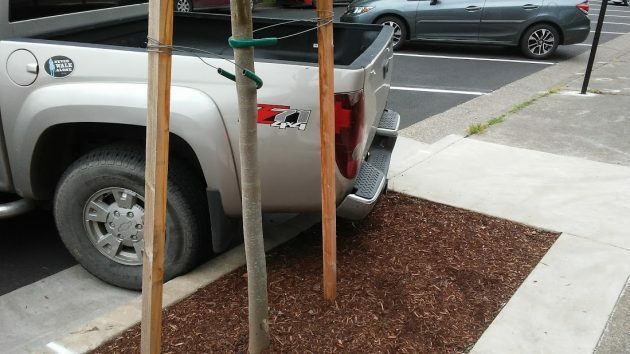 I am very curious who the architect of this “oh, I have a great, more modern way of parking,” idea was, someone in our local municipal politico? Oh well, I guess it is like TV, if you do not like the channel, park somewhere else. Hope someone in the city regains some common sense and re-stripes. When the back in parking spaces were proposed/designed they were going to be ten feet wide. You might remember my stopping by LBCC main campus and measuring theirs. After seeing cars parked and trying to back in myself I decided to revisit the width measurement. The four photos with Patricia and me show them to be just shy of nine feet wide by the one we measured. At the curb distance from line to line was just over ten feet. Is this a new form of (government) measurement? 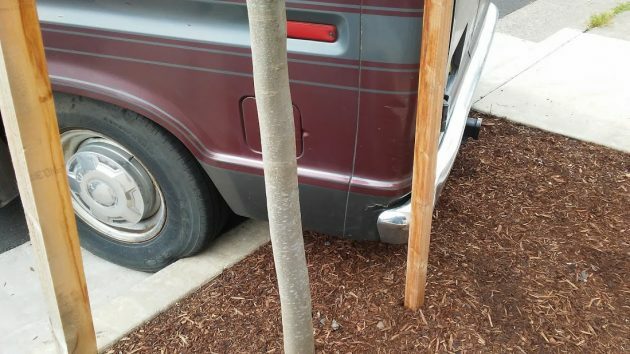 What is wrong with just normal FRONT in parking? Everyone should be more acquainted with that. They can back out when they leave. Obviously, by looking at the photos, people are having problems with Backing in and parking, rather than backing out and leaving. I myself do not have an issue with backing, parking, or any other vehicle related routine. The problem I have is trying to avoid my vehicle getting damaged because someone else has problems parking let alone Backing in and parking. I just went by the post office (on my bike, of course) and saw that almost every back-in space on Second Ave was occupied, and not a tire was on a white line! People can do this, ya know. City employees probably got the memo to “make it look useful”. Fake commentary! Prove it! I’m quite sure their workload alone makes this asinine comment mute. But maybe you have something on them. Them being public employees. No? Prove you’re not a fake human and use your real name. I am not a Russian bot spreading fakery with the goal to destroy this country. I was there last week, just driving through to see the new set up. I had to stop and wait for a driver to attempt backing in, it took three tries. Now one could get past, by the time they finally parked three cars were waiting to go forward. NOT good. Pulling into a space is easier tan backing in. 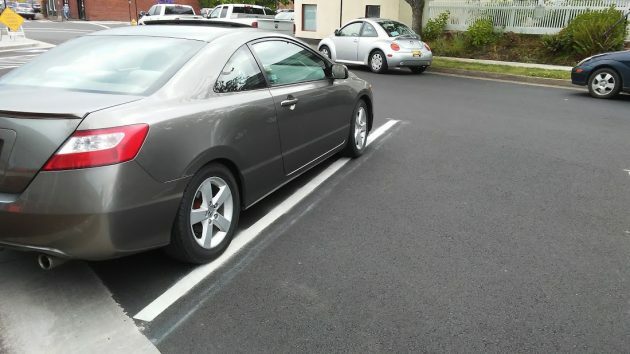 One can see the parallel lines to park between, and the car is aligned correctly. Backing in is more difficult. Backing out is easier than backing in. Again, you are already aligned from when you pulled in, so if one just keeps the wheels straight, one backs out correctly. This design is unnecessarily difficult. Now, while I can back in, I will not use those parking spaces. I’m not worried about my skills, but rather about the driver on either side of me attempting to back in and harming my car. Or having them park so close, as it is difficult, that they bang my car with their doors. Then again, I also park in the far corners of the parking lot at Fred Meyers and Safeway. In light of what is going on in the country, is this issue really consequential? I agree. There are even unsubstantiated innuendo perhaps intimating that just maybe the photographer staged the photo of the car being outside the white lines. This conspiracy cannot be allowed to continue. The logical conclusion is that someone at City Hall Traffic Control may possibly be, in some way, colluding with Albany auto repair shops in an effort to gin-up more business. An investigation should commence, although it seems obvious that no one from City leadership ought to be allowed on the investigating committee. Perhaps an Independent Counsel? In case it becomes necessary, I know of a manufacturer who makes 11-foot poles for political controversies you wouldn’t touch with a 10-foot pole. Ray, if from Poland, shouldn’t that be 3.048006 Meter pole?? ?